It’s not a single, solitary lie but several falsehoods that thread their way through Helen Dunmore’s latest novel, one of many finely imagined works of homage to and acknowledgement of World War I being published in 2014, the year that marks a century since its commencement. In grammatical terms, most of the lies are nouns, but this one is quoted too: ‘They all dead did lie,’ a telling line from ‘The Rime of the Ancient Mariner’, resonating long in Dunmore’s story of battlefield carnage. The quotation is one of many poetic references that seam the story, with Matthew Arnold’s ‘Dover Beach’ line, describing ‘ignorant armies’ clashing by night, ringing like a chorus. Dunmore’s carefully imagined study of life in the aftermath centres on Daniel Branwell, a Cornish man who survived the fighting and has come home. One lie central to the existence Daniel is now living justifies his dwelling in a remote cottage and working its land. Then again, there’s the lie that he has told about the dying moments of his closest friend Frederick, to soften the blow. The truth about Frederick is not something Dan can expunge so easily from his own consciousness. Frederick still haunts him, by day and by night. Ghosts linger in The Lie and the spirit of M.R. James is invoked to lend a terrifying dimension to their presence. But there’s also more than a whiff of Wuthering Heights to the character cluster of Dan, Frederick and his dear sister Felicia, the latter being children of the local big house. Dan grew up dirt poor, too poor even to sit for the scholarship he would surely have gained – his family needed his wage simply to live. But Dan is cleverer than all the others, with a quick brain, photographic memory and survivor’s instinct. Frederick, softer, weaker, but privileged, will be the officer leading Dan’s band of volunteers in the fatal raid. Returned to Cornwall and restoring his friendship with Felicia, now a war widow with a small child, Dan is caught between the truth he can no longer tell and his hopeless dreams of what a happy future might be. The reader knows it cannot end well. Yes, there are echoes, clichés and predictabilities to Dunmore’s storytelling, all of which weaken its impact, but there are strengths too, notably in the novel’s poetic intensity, its devoted portrait of a corner of Cornwall and the empathetic recreation of Daniel’s tortured psyche. 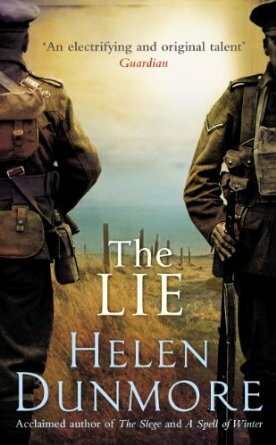 And then there’s the other lie hanging over this short novel, the old one, the one Wilfred Owen skewered in ‘Dulce et Decorum Est’. Behind the expertly crafted yet not quite plausible foreground of Daniel, Dunmore’s detailed descriptions of the battlefields of World War I offer corroborative testament to the bitter truth about that terrible conflagration.